Ms Mwatha's father Mr Stanislas Mbai told Nairobi News that the family has been to the Kenyatta National Hospital, Mama Lucy Hospital, Dandora hospitals and even city mortuaries in search of her with no success. "We are still hopeful we will find her alive because we have been to hospitals and mortuaries around Nairobi but she is not there," said Mbai. 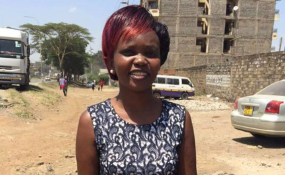 "Amnesty International Kenya calls upon the Directorate of Criminal Investigations and the National Police Service to thoroughly investigate Carol's disappearance, establish her whereabouts and deliver her to her friends and family," executive director Irũngũ Houghton said in a statement. Amnesty International now plans to discuss the protection and safety of human rights defenders in light of Caroline's disappearance. "When you are dealing with police killings, you target specific police officers and they have not been very kind to us. The killer cop has been issuing threats to us, including Caroline," he said.